bright blue, orange-flavoured cocktail mixer, you’re not wrong. It’s also a whole lot more. The island of Curacao lies way south in the Caribbean, out of the hurricane belt, with diving 360-something+ days of the year. About 35 miles off the coast of Venezuela, a few miles west of Aruba and a few miles south west of Bonaire, Curacao is the biggest of the three islands (often referred to as the ABCs, go figure). Curacao is not quite what you might expect a Caribbean island to look like – or be like – and its uniqueness is reflected every aspect of the island and daily life. It’s highly diverse, with heaps going on in terms of dramatic landscapes and beaches, history, music, geography, language, food, culture, architecture, flora and fauna, activities day and night… you name it. You certainly shouldn’t be bored! Getting to Curacao is increasingly easy. Check out the Curacao airport website for the latest flight / carriers info, and below for heaps of reasons why folks just like you are coming to discover, dive and enjoy Curacao. Prevailing winds are from the NE and the prevailing current (usually mild to none) runs East to West. This can reverse during rainy season, so check with the Dive Bus Crew. And on the very rare occasion when the wind switches to S/SW, hang on to your hats and stay East (where we are) or head West to go surfin’ instead of divin’ ! 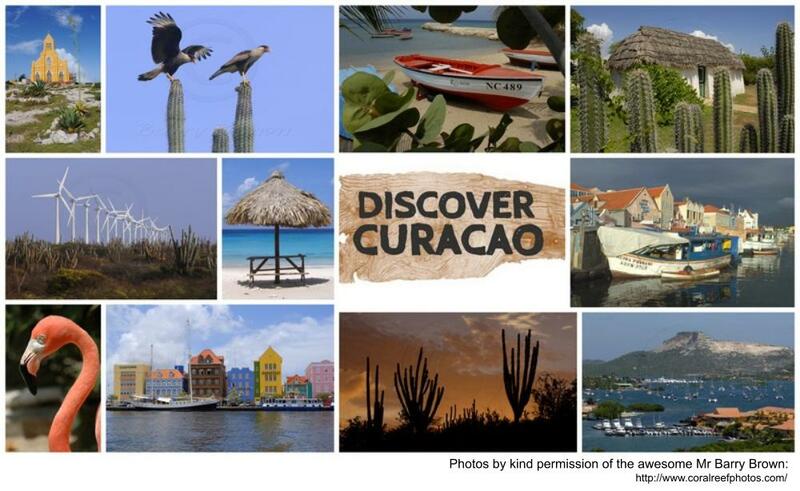 Find out MUCH more about diving Curacao here. Curacao is usually pretty damn hot and gorgeous all year round, with an average temperature of mid 80s F / mid 20s C.
Rainy season starts around October / November and continues through until March-ish. It’s a relief when the rain comes, bringing the cooling trade winds again, and the island turns from desert-like to lush green almost overnight. The rain usually falls at night or early morning, with the ‘regular’ sunny weather in the day time. Temperatures are generally a little cooler than the rest of the year. If it does rain in the daytime, enjoy it. Everything smells clean and fresh and looks lush and green. And as quickly as it starts, it’s gone and the sun bursts back out again and dries everything off. So don’t worry about being in Curacao during the rainy season – it’s a great time to be here! Curacao is 180-ish square miles, 37 miles long by about 9 miles wide at the widest part. Papiamentu is a mixture of Spanish, Dutch, French, African, Portuguese, English… The locals are a talented bunch. Approximately 140,000-ish, representing approximately 50 different nationalities. This massive mix of nationalities makes for a wonderfully integrated, multi-cultural island – and a very broad choice of cuisine styles and flavours! Although Curacao is out of the hurricane belt, it's in the constant path of the trade winds, bringing lovely, much-needed relief from the warm temperatures pretty much all year round. These winds, plus the occasional tropical storm, mean that most of the beaches are rocky or coral rubble rather than sand - apart from at hotels and other private beaches where sand is brought in. The naturally sandy beaches that you do find, are protected from wind and currents. Palm trees are not indigenous to Curacao (although we have plenty of the) so don’t be surprised to see cactus on the beaches. (Seriously). There are descriptions of the beaches at The Dive Bus shore dive sites here and plenty of beaches and other topside photos here. You’re coming to this lovely Caribbean island to relax – and relax you will, whether you like it or not. That’s just the way it is and after a couple of days, you’ll find that it’s not a bad thing at all. Just make sure you get to the restaurant before you’re hungry. Curacao provides an ever-increasing selection of accommodations to suit all tastes and budgets, in a number of very different areas / locations. 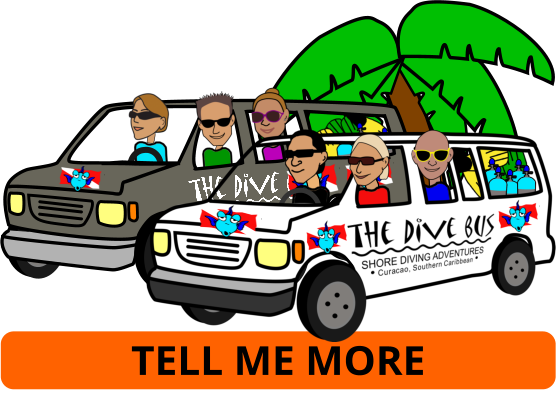 The Dive Bus is based outside of the Willemstad area, close to Curacao Seaquarium and Breezes / Sunscape Hotel – more info here. Our pick up service covers accommodations in the Willemstad area, but we dive all over Curacao. So if you’re staying elsewhere, just drive to us for your first day of diving, then meet us onsite for the rest of your dives – simple! Plugs are usually 110v, US-style. Larger hotels may also have European sockets and/or adapters but don't bank on it. Bring your own just in case. We may have electricity on Curacao but hot water is usually only available in hotels – and not all of them, all of the time, and not necessarily the ‘hot’ you’re used to at home. Curacao sometimes gets a bad rep for safety and security which is somewhat unfair. It’s no better or worse than other places we've traveled to or lived in – including the UK and USA – and just like everywhere, it’s about using your common sense. In fact, you’ll probably be pleasantly surprised by how friendly most people are: a smile and a nod will get you a VERY long way. Crimes against the person are rare, but, like back home, don’t wander around certain areas after midnight, flashing your Rolex or your fancy camera. Crimes against property are less rare, unfortunately. Leave your belongings unattended on the beach or in your car, and you may find they belong to someone else by the time you return. So keep your money and your valuables with you at all times, and only bring what you need when you head out. invest in a dry-box and carry your money, credit card, DAN card and PADI card with you on the dives. It doesn’t even need to be a dry-box – soggy dollars are widely accepted (it’s still cash after all) and if your credit card has survived a turn in the laundry machine, a dive or 2 certainly won’t hurt. If you rent a car, leave the vehicle unlocked and windows open a bit so would-be thieves don’t have to smash them to enter – only to find there’s nothing to take, as you took your valuables with you. Bring your common sense, and leave your 6 passports and $1000s at your accommodation. Your tap water is distilled from the ocean and totally potable. It’s also very expensive and sometimes scarce, so use it carefully and wisely please. As all trash goes to landfill, please refill a water bottle rather than buying plastic bottles of water. And recycle your plastic and aluminum at the Greenforce recycling centers around the island, including The Dive Bus. Since a one way taxi ride from the airport to your accommodation will cost you at least $25, you may want to arrange to pick up your rental from the airport. There can be an additional charge for this but it may be worth it for the convenience and time-saving. You’ll find some of the usual international car rental brands here in Curacao, as well as a bunch of local companies which are generally cheaper than the big boys. Regular cars with a trunk may not be as much fun but they are more practical in terms of security. You’ll get air co instead of the trade winds rushing through your hair, and you’ll be able to leave valuables, including spare tanks, hidden in your trunk. We recommend a car rather than a truck so you can use the trunk for stuff - including spare tanks. Check out these Security Tips to help avoid theft from your vehicle or elsewhere. Avoid excess car rental charges by using a tarp to cover the car seats and protect them from all the sand your equipment will pick up from the beaches. Lots of car rental companies charge extra to clean out the sand.... Bring a tarp with you from home or buy one up from The Dive Bus. Invest in a dry box - cigarette pack size is ideal. You can fit your c-card, car keys, room key, money, credit card, DAN details and emergency contact in and take it out diving with you. This way you'll have all your important stuff on your dive so you can relax. Available at The Dive Bus. More info on Trip Advisor here. Whether you are driving or being driven in Curacao, you need good insurance and nerves of steel. Follow the rules, but don’t expect anyone else to. Expect the unexpected, and nobody to stop for you (even if you have priority) and you should be fine. The locals either drive on island-time (dead slow) or like rally drivers. Neither group tend to worry too much about priorities at junctions, red lights, overtaking in on-coming traffic or on corners, hills etc etc. Traffic lights, speed limits and road markings (if present) are more ‘suggestions’ than regulations. Horns are used as a way of greeting on the island, so if you’re constantly being tooted at, it’s probably because someone thinks you’re their aunt/friend/neighbour etc. Or they’re giving way to you. Or you’re driving too slow. You’ll figure it out. From cheap-as-chips to terribly-nice-indeed-darlings with many in between, and all kinds of cuisine-styles, there’s something for everyone for sure. Check out good ol’ Trip Advisor here. Unless you’re planning on treating yourselves to a special meal at a fancy restaurant (of which there are many) you can leave your ties and cocktail dresses at home. Evening dress is smart casual and many places allow jeans, shorts and t-shirts. Many restaurants are outdoors and occasionally it gets chilly in the evenings so bring one warm/long sleeved top with you. Local currency is the Netherlands Antilles Florin / Guilder and abbreviated as NAFl or ANG. Euros are not accepted but US$ are accepted just about everywhere (bring $20s as many places don’t take larger notes), with most service businesses, including The Dive Bus, showing pricing in both currencies. The US$ / NAFl exchange rate is between 1.75 – 1.80 NAFl to US$1. Foreign currency exchanges are handled by banks rather than cambios / money exchanges. But: no passport, no exchange so remember to take it along. Major credit cards (Visa, Mastercard) are widely accepted, although many businesses will levy a charge for using them as the merchants’ bank charges here are pretty steep. This may show on your bill as a ‘service charge’ and is not the same as a tip. If you pay with credit card, your transaction amount will show as, and be charged in, US$. Chip and PIN credit cards work here, no worries. AmEx, Diners Club and non-major cards are not widely accepted on the island (or at The Dive Bus) due to even higher bank charges to merchants. These are widely accepted but note that your transaction amount will be shown as, and charged in, NAFl (local currency). You can also use these to withdraw cash from ATMs – check with your bank as some levy daily maximum withdrawal amounts. Don’t bother! Most places, including The Dive Bus, don’t accept them due to the banks’ tendencies to reject them for no good reason. The cost of living on Curacao is pretty reasonable, especially compared to other Caribbean islands. A decent meal in a decent restaurant with drinks is about $30-35 per person – although you can pay a lot less AND a lot more. There’s a lot of choice, something for everyone for sure. The same cold beer can cost as little as $2.00 from a little local shop/bar at the side of the road (called “Snacks”) to $6.50 in a stylish beach bar. As of 1 January 2014, all prices should be inclusive of sales tax (“OB”) so the price you see in a store should be the price you pay. However many restaurants and hotels also add service tax which can anything up to 15%-ish. This may be to cover credit card fees (the banks don’t ‘allow’ merchants to levy these) or tips, so you may want to check with your server.